If 2013 slips through the country’s fingers, Russia will fail to fulfill Putin's promise to enter the top 20 countries for best business climate. 2013 looks set to be a decisive year in terms of President Vladimir Putin's pre-election promises on economic policy. Chief among these was his promise that Russia would have one of the top 20 business climates in the world by 2018. Plenty of time, as it seems. However, unless 2013 is utilized properly, Russia will struggle to meet this objective. Why does it matter so much? First, the target is measurable and the ranking is determined by a body independent of the Russian government. Second, the promise cannot be fulfilled without improving the performance of the country's institutions. Third, improving the business climate will spur economic growth. One year ago — January 30, 2012, to be precise — Vladimir Putin published an article entitled "We need a new economy." The priorities it outlined were subsequently formalized under the decree "On long-term national economic policy," which was signed on May 7, immediately after his inauguration. The decree instructed the government to "take steps to achieve, in particular, the following objectives: improve Russia's position in the World Bank's 'Doing Business' index, from 120th in 2011, to 50th in 2015 and 20th in 2018." The clock is ticking. The 2013 Doing Business rating, published in the fall of 2012, put Russia in 112th place. According to November's Directive No. 2096-r, the gap between the 50th and 112th spot is to be overcome in just two jumps — i.e., in 2014, Russia needs to be no lower than 81st. The Doing Business rating in 2014 will be published in the fall of 2013, and data is compiled from the start of the year. Therefore, it is not too early to discuss the prospects of achieving the leap to 81st in the 2014 index. The legal framework for 2013 is in place, but, unfortunately, no laws were passed last year to improve the business climate. The State Duma was busy with other important matters: regulating the Internet and NGOs, increasing fines for attending rallies and slander, and its response to the Magnitsky Act. As a result, Directive 2096-r is likely to remain in the filing cabinet. 2012 was not completely devoid of action, however. The government and the Agency for Strategic Initiatives drafted a set of roadmaps to improve the business climate in various areas of the economy. These roadmaps are to be implemented in the form of new laws and regulations, with the aim of raising Russia's position in the 2015 rating, at least. Another seemingly key promise in the May 7 decree is the exact time frame set for the privatization of state property. Putin instructed the government to draw up, by November 1, 2012, a privatization plan to provide for "the government's complete withdrawal by 2016 from the capital of companies in the 'non-raw materials sector' that are not natural monopolies or related to the defense industry." Specifically, this means the full privatization of all banking assets (Sberbank, VTB, Russian Agricultural Bank) and the full privatization of transport assets in competitive sectors, including Aeroflot and Sovcomflot. The implementation of this ambitious program will improve the managerial performance of the privatized companies and raise the level of economic competition. The only question is whether the program will actually be implemented, since previous privatization programs have been systematically discarded. Unlike the push to move up the Doing Business index, in this case, even the preparatory work remains untouched. 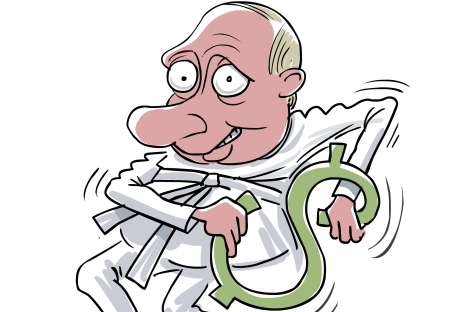 If 2013 does not see the publication of a 2014-2016 asset privatization program, then all hope of implementing Putin's decree on schedule will be lost. What is the likelihood that Vladimir Putin's campaign promises to improve the business climate and privatize assets will be kept? We believe that it is perfectly feasible, but, for it to happen, 2013 must be a year of deeds, not words.